None of these teas come from the tea tree or “Camellia Sinensis”. They are all theine free. 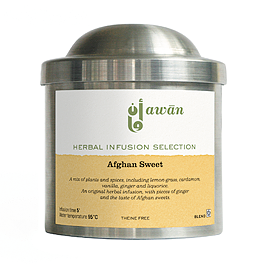 The Awan selection offers an original range of herbal teas with diverse tastes, origins and health benefits. Rooibos, the famous South African herb sometimes called ‘red tea’. A vitamin-rich, theine-free infusion, with flavors of vanilla and cacao and pieces of chocolate and caramel. A gourmand and appealing mix. Rooibos, the famous South African herb sometimes called ‘red tea’. A vitamin-rich, theine-free infusion, with flavors of red fruits and pieces of dried strawberry. A pleasant way to initiate the young ones to infusions, their great tastes, and many benefits. A mix of rosemary, mint, anise, thyme, sage, basil, liquorice and cinnamon, with bergamot essential oil. A magical remedy for digestive, circulation and joint problems. A mix of sage, eglantine, orange and melissa, flavored with orange peal. A magical potion for meditating and relaxing. A certified organic blend of lemongrass, South American maté, lemon peels and Yunnan green & Pu Er teas, flavored with lemon. A mix with appreciated depurative properties. A delicious way to purify the body and tonify the soul! An all-day and evening infusion. Specially produced for Awan by Kouroum Bsous (Silk Museum) from mulberry tree leaves. An antioxidantrich tisane with a fruity, soft and gentle taste, close to natural green tea. A mulberry tea, known in China to prevent sugars from entering the bloodstream, thus helping to reduce bad cholesterol and fight diabetes. An organic chamomile tea from the Chouf mountains produced by Treasures of Lebanon. Made from wild chamomile, a flowering plant from the daisy family that gives one of the world’s most famous herbal infusions. Known to calm muscle spasms, soothe nerves and aid digestion. Specially produced for Awan by Treasures of Lebanon from wild plants picked near Nabeh Es-Safa in the Chouf region. An organic and fragrant mix of ‘Zoufa’ (Hyssop), ‘Khatmiyeh’ (Bristly Hollyhock) and roses. A relaxing and purifying infusion with many benefits that include calming coughs and soothing sore throats.